Green tea: the healthiest variety of tea – Camellia Sinensis. The history, production, cultivation, processing and quality of green tea. Unsurprisingly, green tea takes its name from its colour, as the infused tea is usually vivid green. Even so, green tea can be found in a wide range of tones, depending on the type of tea and its cultivation: from a light, bright green (e.g. Gyokuro); to deep, dark shades (e.g. Sencha or Kamairicha). For almost 5000 years, green tea has been regarded as one of the healthiest and most delicious medicinal plants. The many beneficial >>ingredients<< in green tea are available in a water-soluble, bioavailable form. The following substance groups are particularly of note: bitter substances/tannins (polyphenols)/amino acids, including catechins, theanines, saponins etc. ; essential oils; caffeine/theine bound to tannins; almost all vitamins, minerals and trace elements; antioxidants; and many more important secondary plant compounds that remain largely unexplored, such as EGCG. The specific >>effects of green tea<< on the body, however, are not only due to the presence of individual beneficial ingredients, but above all because of the unique combination of substances it contains and how they bond together. In contrast to the caffeine in coffee, for instance, the much-discussed caffeine in green tea is bound to tannins and thus has a positive effect on health. Numerous scientific studies underline the benefits of green tea: it helps to maintain good health, as well as to prevent, and even cure, diseases. Green tea, as well as all other tea sorts worldwide, originate from the same plant >>Camellia Sinensis<<, which is native only to China, Taiwan and India (Assam). The plant requires a lot of sun, as well as much rain – without any risk of waterlogging. Sinensis thrives at high altitude, has a slow growth speed and is used in high-quality green teas, with its smaller size and finer leaves. The second variety, the var. Assamica, is native to India and grows much larger. It thrives at lower altitudes, thus growing much faster, but has less beneficial ingredients and a rougher, more bitter taste. 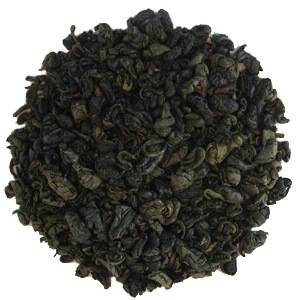 Consequently, it is less suitable for producing good quality green tea. Between these two plants there are numerous other varieties and hybrids. 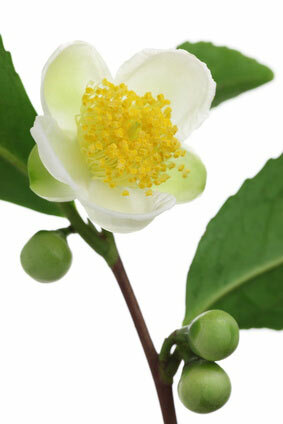 In addition to green tea, there are five >>tea varieties<< worldwide: white, yellow, oolong, pu-erh and black. Strictly speaking, herbal tea is not tea, but an infusion. All teas have different health effects and flavours, but in general green is by far the healthiest. All tea varieties differ mainly in one characteristic: the degree and process of fermentation. The tea leaves oxidise after they have been harvested, due to atmospheric oxygen and numerous substances in the leaves undergo chemical transformation. This mainly concerns tannins, which are converted into flavourings and certain vitamins and minerals, which are reduced. From white to yellow, oolong to black, the degree of fermentation is increased through targeted interventions. With pu-erh tea, the rapid fermentation is first stopped early and it is then slowly “post-ripened”. Black tea is almost completely fermented. Through this process it is possible to bring about changes in taste. Specifically, the British colonisers of India recognised this and used it to make the var. Assamica more palatable, which was significantly more productive and easier to cultivate. Due to the British export efforts, until today the consumption of original, pure green tea in Europe has be far surpassed by black Assamic tea. Depending on the degree of fermentation, distinct varieties contain different ingredients and therefore have different effects. 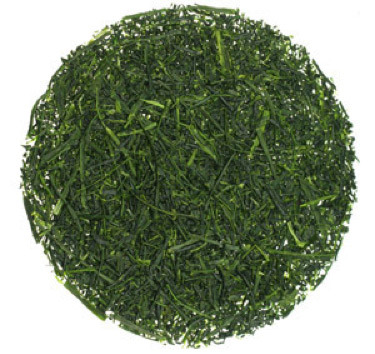 Through various production processes, the fermentation of green tea is prevented. The method used almost exclusively in China is roasting, where the leaves are heated in either a pan or oven. Unfortunately, the roasting process (up to 300 degrees Celsius) damages the healthy active ingredients within the tea to a large extent. In our opinion, and according to personal kinesiological tests, the tea loses almost all of its health effects once roasted. In Japan, on the other hand, the main method is steaming method (with the exception of Kamairicha and Hojicha varieties), in which case the tea is treated with a brief and gentle steam. Through this method, almost all active ingredients are well preserved. The world’s most important green tea producing region – China and Taiwan – has by far the widest range of varieties. Data on the exact number varies greatly, however we estimate that there is a little over 1000 different species and a huge number of individual brands or tea gardens. The most common varieties are Chun Mee (of various qualities) and Gunpowder. The better known high quality varieties include: Lung Ching, Green Rock Snails, Pi Lo Chun and Mao Feng. >>Japanese tea varieties<< on the other hand, have a more systematic, simple principle. In essence, 10 large, steamed varieties exist: Sencha (about 80% of production), Gyokuro (most expensive variety), Kabusencha, Tencha, Matcha (and micro-cha), Shincha, Bancha, Hojicha, Genmaicha and Kukicha. We are of the opinion that green teas produced in Japan are generally superior from a health point of view. The >>history of green tea<< is almost unique among medicinal plants. Green tea is the “mother” of all other tea varieties and has been used in >>China<< for the last 5000 years. It has been cultivated in Japan for the last 1000 years approximately, revered for its taste and health benefits. Initially used almost exclusively for its healing properties and health-promoting effects, it was over time cultivated for taste and social purposes. Green tea is now grown in about 50 countries. According to estimates by the FAO (Food and Agriculture Organisation of the United Nations), world production of green tea will amount to around 900 000 tonnes in 2010. In comparison, in 2010 world tea production amounts to 4.1 million tons. Based on a production of 681 000 tonnes of green tea in 2000, the estimated global growth rate is roughly 2.6% per year. According to FAO estimates from February 2012, the production of green tea is expected to increase rapidly to around 2.6 million tonnes by 2021, driven primarily by China. The largest producing country in 2010 (estimate) remains China with 671 000 tonnes, followed by Japan (91 000 tonnes), Vietnam (50 000 tonnes) and Indonesia (49 000 tonnes). In terms of exports, China dominates the market almost completely, with 210 000 tonnes coming from China; in contrast to 1 000 tonnes from Japan and 25 000 tonnes from Vietnam – out of approx. 254 000 tonnes of exports worldwide in 2010. The best known >>growing regions in Japan<< are almost exclusively in the southern part of the country and are: Shizuoka, Kyūshū (especially Kagoshima) as well as Mie, Uji and Nishio (Matcha). When growing green tea, the following cultivation phases are particularly important: harvesting the cuttings (June), planting the cuttings (March to April), pruning (spring and autumn), trimming (every 2-3 or 5 years), shading (Gyokuro, Kabusecha, Shincha and Tencha/Matcha), frost protection, pest defence/control, fertilisation (up to six times a year), tillage, and harvesting/picking (2 to 4 times a year). About 70-80% of the total green tea production costs are due to the expense of picking. In particularly high-quality gardens, green tea is harvested by hand, whereby a maximum of only three of the youngest leaves are harvested per shoot. When specialised harvesting machines are used, however, about 4-5 leaves are harvested per shoot. Only about 1 kg of tea can be harvested from 3 kg of leaves. Harvesting in Japan takes place up to four times a year: April/May, June, July/August and mid-September. In better gardens, the fourth or even the third harvest is often avoided. The first harvest is considered the best in terms of taste. We also recommend drinking the second harvest daily for health reasons. 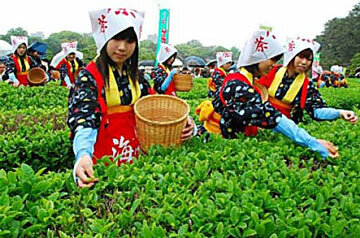 After harvest, the green tea must be made from the leaves very quickly: within about 9-13 hours. Therefore, the processing is usually carried out on the grounds of the tea garden. The most important steps here are withering the tea leaves (2-4 hours), heating or steaming (see above), rolling, drying and packaging. In terms of taste and health benefits, the quality of a green tea depends primarily on the following aspects: quality of the cuttings, storage, climate, weather, care given to cultivation and harvest, processing methods, maintenance of the garden and whether or not it is organic.